Matt kitchens create an interesting and unusual look, whilst still keeping everything sleek and sharp, incorporating clean lines and contemporary accents. A matt kitchen finish delivers a velvety-smooth texture to surfaces and to kitchen units. 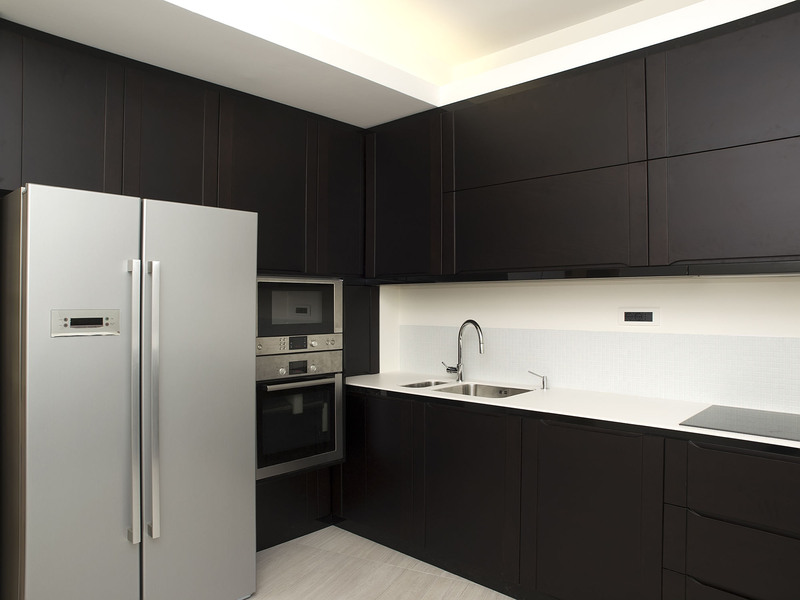 Unlike high gloss kitchen finishes, they do not deeply reflect the light and lack shine and lustre. Matt finishes can be tailored either to create an impact – perhaps with black matt units and a matt finished stone worktop – or to create a subtle effect – matt white units in a room that receive lots of natural light will be less bright than if the units were high gloss. Matt kitchens are extremely durable and require little and easy maintenance. They can also be more resistant to everyday markings such as finger and hand prints. Their versatility and many positive attributes have led matt finish kitchens to become one of our most popular choices. Here at Designer Kitchens we can offer you a matt finish kitchen in a broad range of styles and colours. Matt units are constructed with a medium density fireboard (MDF) core. MDF is used as it is dense, flat, stiff and has no knots. It also does not have an easily recognisable surface grain, so that we can create a seamless matt finish. It is a very versatile and good quality material and is perfect for use in matt finish kitchens. At Designer Kitchens we showcase an expansive range of matt laminate kitchens, so that we are able to accommodate to the needs of all of our clients. Certain models of matt laminate doors are among the most economical choices from our entire range. Do not let this lead you to believe that what you gain in cost-effectiveness you compromise for in quality. It is difficult to readily identify these doors from the more expensive ones. Our laminate matt kitchens are manufactured using a very complex and advanced engineering process. Semi-molten foil is formed over a pre-machined substrate inside a vacuum, which is then pressed and adhered together. The process is designed to achieve the de-lamination of the foil in the substrate, therefore creating the matt finish. Matt lacquer kitchens are an über stylish choice for any modern kitchen. They are incredibly durable, are very easy to clean and the range of colours on offer is extensive. The finish adds a depth of colour that many other finishes do not achieve, creating a luxurious and high quality aesthetic. The matt lacquer kitchen finish is created by spraying a door with structured lacquer paint repeatedly. Though the process is very labour intensive, the unique appearance of the doors when finished is unparalleled by almost any other finish. The final product features a continuous, edge free door facia, perfect for any contemporary kitchen. Matt Glass kitchens are perhaps the most unusual of all our matt kitchen finishes, with exclusive and limited supply you will not find this in many homes. A truly modern material, matt design glass comes in numerous distinctive colours. Each colour has its own exquisite tone and the quality is rich and consistent. Sleek and impossibly stylish, a matt glass kitchen provides a look of elegance and sophistication. A true staple of a luxury modern kitchen, it compliments beautifully other gloss, lacquer, stainless steel or veneer finishes. Matt glass kitchens are favoured by many architects and interior designers, particularly for creating glass kitchen islands and feature wall cabinets.